I grew up and continue to live in North Vancouver, British Columbia. I also work for the City of North Vancouver, as a development technician. I swam as a competitive swimmer from age nine to twelve. It wasn’t until I was 37 years old and in much need of a “life style change” that I decided to swim again. 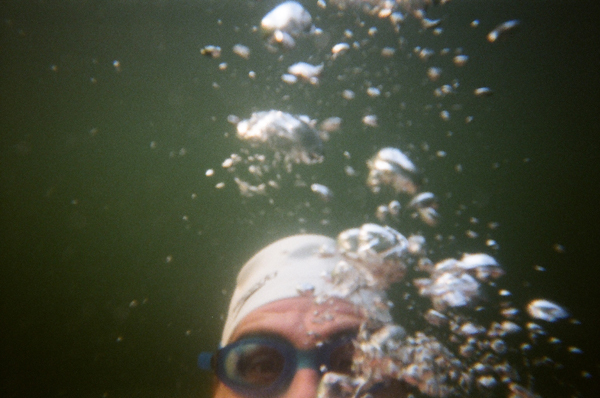 After joining the local masters swim program, I soon found myself competing at local swim meets and open water events. I have always felt at ease in the water and soon became addicted to workouts in the pool and in the ocean. Running used to be my outlet, but swimming has taken me to another level. I lie in bed most mornings and think… should I swim or sleep? Nine times out of ten my feet hit the floor and I’m looking for a water workout. Midlife may be denied but not escaped! Do I really have to give up who I think I am so I can become the person I was meant to be? Is midlife about searching for the true meaning of life or is it an opportunity for a spiritual awakening? At 49 years old, I feel that I’m half way to where I want to be, but at the same time I’m somehow comfortably stuck right where I am. I normally just “wing” things, but for the channel I will take a different approach… HELP! One of the first things I wanted to do was surround myself with the right people. If you could assist me in reaching my goal, my plan was to secretly line myself right up with you. If your favorite color is blue, imagine that…mine too! Brent Hobbs is definitely one of those people. 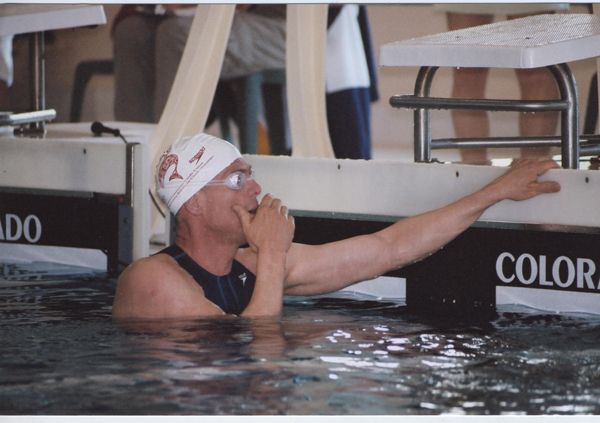 At 42, he is a growing legend among our swimming community and has a number of swimming feats under his belt already, including the English Channel and Bowen Island, not to mention his indoor swimming accomplishments to date. In the summer of 2008, right after he returned from his very successful channel swim he told me that I could do this thing if I really wanted too. This would be the defining moment that would concrete my decision. I will be forever in his debt for all his experience, wisdom and support leading up to my attempt. I have now ordained him as “Spiritual Advisor”. The first thing I had to do before this whole thing could unfold was to take inventory. I had to recon with what I have. Do I have a full time job? Yes. Do I have children? No. Do I have a significant other? Yes, her name is Bonnie and she is my beautiful fiancée. Am I financially independent? No. How much free time do I have to train? These are the questions that set the tone. I don’t want to get myself into a situation where I’m burned out, so ultimately, I have to maintain a balance between training and life. One of the secondary goals that I want to focus on is swimming the distance freestyle events at the Canadian Masters Provincials and Nationals. This will force me to work on endurance, strength and speed. I want to use the indoor swim season to keep focused until early spring. April and May will be a combination of indoor and outdoor training. My friend, and one of my coaches Suzanne Scriven was kind enough to put together a training schedule for me. This strategic piece of information will dictate the next six months of training including: rest days, mileage count and tapers for both the Channel and Nationals. Putting pen to paper has made such a difference, as opposed to everything floating around in my head. 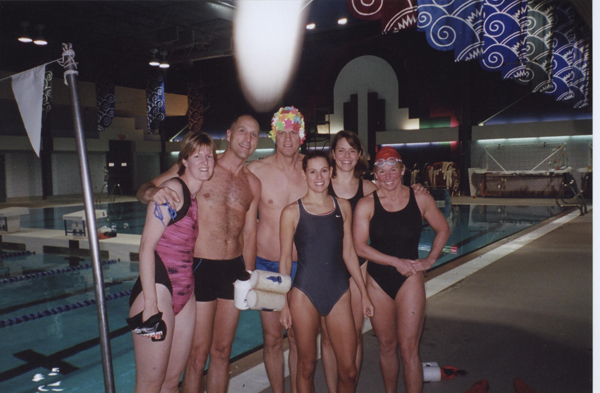 Truthfully, the “Tubes” are a competitive group of master’s swimmers and triathletes including one of Canada’s former Olympians Graham Welbourne. Graham was a star on the Canadian National Team and one of the best freestylers Canada has ever produced. So…like I said, the trick is to secretly line yourself up with the right people. This entry was posted in Training and tagged Brent Hobbs, Gooey Tubes, Training. Bookmark the permalink. Great blog. I am humbled by your comments. I have swum behind you for a few years now and had no idea you were so damn smart! Yeah, yeah, you’re a pretty good swimmer 😉 but consider me hooked on your writing. Looking forward to following your training and adventures. Let’s talk turkey, or shall I say chicken. How will you feed yourself during a 10-14 hour long swim? Our summer aquatics club is so impressed by this great adventure you are about to embark that we would like to lend you some financial support. We would also like to challenge all other North Shore based aquatics clubs to do the same. hey rod ! hello from sunny palm springs. just thought I would check out the blog and am happy to see some new bits. keep up the good work. I’m with Cruisers Aquatics. As mentioned by Rob F from your masters group, we want to make a sponsorship contribution to your swim, as well as have you interact from time to time with the athletes in our summer aquatics club — talking to them about your (mental and physical) training, preparation and journey. Please email me for followup discussion. Good luck with your preparations Rod! Brent often speaks about you so it was good to meet you at Nationals! Always welcome to come and do some lake swims in the Okanagan! Rod…we really want to see you when you come in to train…let us feed you and the crew…we are so proud of you…mainly because I never thought you’d amount to much in your life! As always I say this with tongue in cheek and anticipation of a comeback remark…MILLER! Hi Rod–just thinking the big swim is coming up and want to wish you the very best, will be cheering you on and hope it goes well. 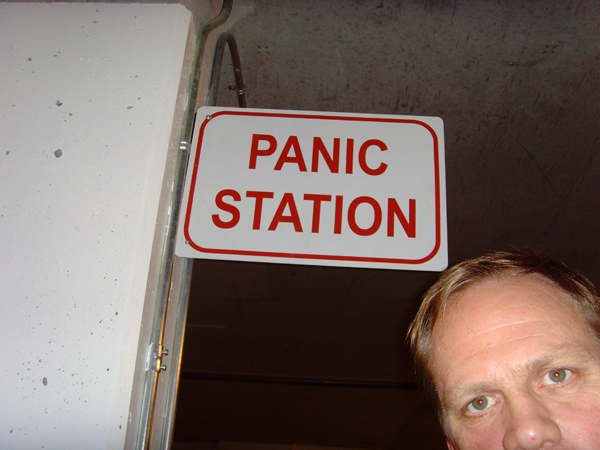 Be anxious to hear any news………..J.
Rock’in Rodney, just read about your quest in the NS News (where else!) today. And remembered you talking about it last time we bumped into each other. Hey just want to wish you the best, good to see you are following your dream, or was that a bet?? Ya gotta love mid life crisis…es! Hopefully you’ll have calm seas, and a successful swim. Today is July 15th, so you could be in the water tomorrow! Good luck! today is the 19th so I am only presuming you have swum the mighty swim? How did it go. I see your spiritual advisor was wondering how you would feed yourself during a 10 -14 hour swim too. Does he know of your secret addition to your pantry? Wow !!!! .congratulations That is so so great Rod. I can’t imagine how you must feel right now, besides being very tired of course. What a great day . I am so happy for you, I guess we’ll have to celebrate when you return home. An EMSC teammate, Wayne Strach, is planning to swim the English Channel this summer. He’d like to contact you about this. If you’re interested, let me know. I know of a fat burning energy bar that will be ideal for your training AND the actual Channel Crossing. It is used by Ausie long distance swimmer, Tammy VanWissee.